WORLDWIDE: Wind power has not lost its ability to surprise, as this year's selection indicates. 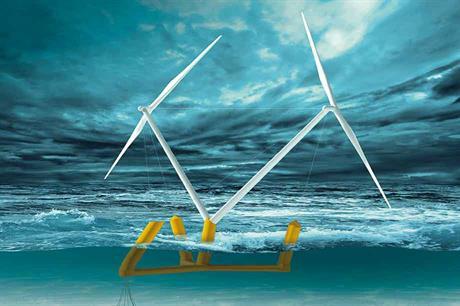 The 15MW SCDnezzy2 fully integrated twin-rotor concept is Aerodyn Engineering's radical vision of next generation large-scale floating power plants. The closely interspaced two-bladed downwind turbine counter-rotate to balance opposing Coriolis forces, and relative blade positions are offset by 90 degrees to minimise rotor-blade interaction causing tip vortices related performance loss. SCDnezzy2 has a specific power rating of 425W/m2. The twin 150-metre rotor solution lowers the centre of gravity substantially compared to a larger single rotor with the same specific power rating, positively impacting floater mass and cost. Each in-house produced turbine is mounted at a ten-degree backward tilted tower in wind-flow direction for sufficient cable clearance and efficient load transfer. The droplet shape with a drag coefficient of 0.3-0.4Cd enhances floater stability, and the open V-shape is "closed" at the top by a cable, creating a compact, lightweight and structurally stiff triangular structure. The tower's central bottom mounting flange to the Y-shape concrete floater comprises one long leg, two shorter legs, and three inward-facing buoyancy columns. Guy wires stabilise the tower and turbines and minimise tower-base bending moments for mass and cost savings. The long leg incorporates a dual-mode single-point catenary mooring/yawing system, eliminating the need for turbine yaw systems. The rotor speed of individual turbines is actively controlled, proving active yaw support to the installation's mainly passive yaw system.